The Silver Sands Casino is a major South African venue. It's been around for a long time. The casino features some very high quality games. The HD games have attracted tons of players to the site over the years. However, the big jackpots are an even bigger draw. 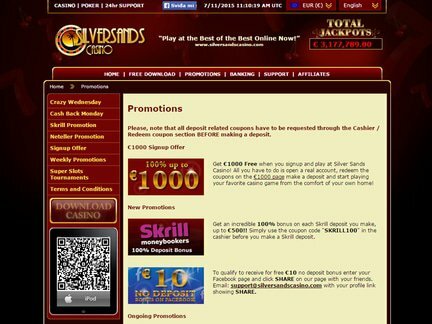 In the promotions section, the players can find a 100 % up to 1000 Euros deal, which is activated upon registration at the casino site. This requires setting up a real money account and redeeming a coupon. The free chips are given on the first three deposits. Special coupon codes are provided on the sign-up offer page. Some noteworthy new promotions would include the Skrill Moneybookers deal. The player can get a 100 % bonus on each Skrill deposit up to 500 Euros. A coupon code (SKRILL100) must be used at the cashier. Social Media has also been utilized to a certain extent. The players who enter their Facebook page and share casino information can expect to receive 10 Euros for free games. In addition to the aforementioned deals, the website carries ongoing promotions. This type of offer would include the Cash Back Monday offer. The player could get 40 % back of all the deposits that were made in a specific time frame on that day. The Secure Socket Layer (SSL) technology protects the transactions made on the site. The transactions could be conducted using a wire transfer. It is also possible to use the Neteller service as well as credit card deposits. Both Visa and MasterCard have been accepted at the venue. Skrill can also be used (it's worth remembering that a promotion is attached to this particular payment method). There are several cash-out methods like; Bank Transfer, Skrill and Visa. A proof of identity is required with a first withdrawal. Typically, the person will be asked to provide some sort of an ID or Passport for the purpose of identity verification. In terms of currency support, the website allows transactions with the following; USD, GBP, EUR and ZAR. The Silver Sands Casino is very popular within South Africa. This is due to the fact that the website is designed with the South African player in mind. However, the website receives regular traffic from all over the place. It is a global online casino. The major slot games are now accessible on mobile devices. In terms of the available games, the Real Series Video Slots have been especially popular. The list would include; Loose Caboose, Crystal Waters, Texas Tycoon, Enchanted Garden, Goldbeard, Naughty or Nice and Triple Twister. The games have some rather amazing graphics and animations. They also have some superb bonus features. In order to play a slots tournament at the Silversands Casino, it is necessary to pay an entree fee. The player typically gets to play for ten minutes. Some of the games are really fun to play. The London Inspector, Warlock Spell and Year of Fortune would fall in that category. The multiplayer poker is another great feature. The names of the winning players aren't provided. However, the casino posts the game title and the winning amount which is associated with it. That way, the player can see the games that have the biggest winnings associated with them. At this point in time, the winner window displays a winning sum of over seven thousand Euros on the London Inspector game. Those are impressive amounts! The casino has received a lot of praise. The complaints have not been heard so far. While the main page may not look spectacular in terms of graphics, the inside content is quite good. The games are well-selected. All the major game categories are represented here.